Add a fun pop of color or a subtle touch to your home with these contemporary swivel stools. Available in your choice of Espresso or Red faux leather upholstery you will surely find one to fit your needs. The seat is padded and a round leg stretcher also acts as a footrest for comfort. 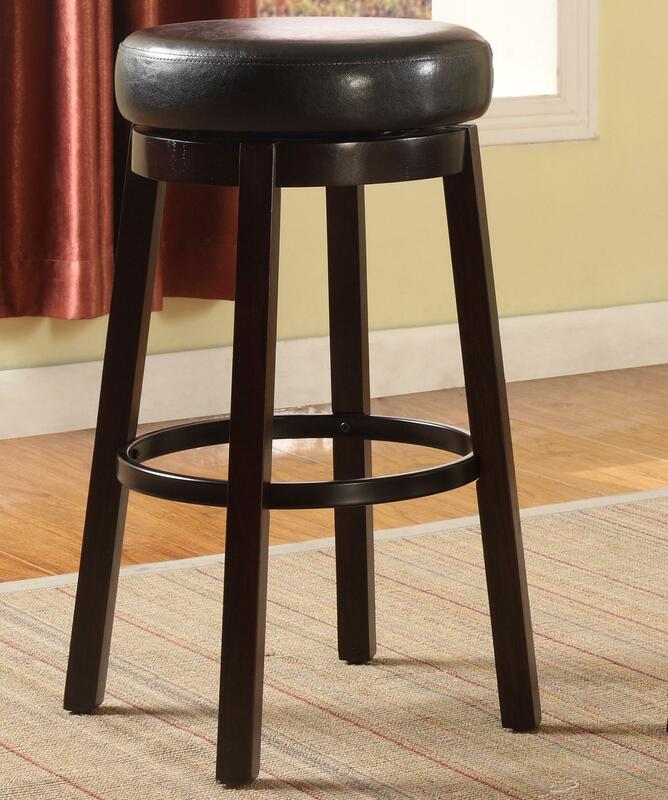 Use this stool at your home bar, kitchen island or counter height dining table for a fun and relaxed look. The Bar Stools Contemporary Upholstered Bar Height Swivel Stool by Rooms Collection One at Rooms Furniture in the Houston, Sugar Land, Katy, Missouri City, Texas area. Product availability may vary. Contact us for the most current availability on this product. Smart design styling and lots of options, makes this Bar Stools collection functional and fashionable for a multitude of design styles and home decors. The stools in this collection are created from a range of materials, including wood solids and veneers all the way to metal frames, with possible wooden contoured seats, or plush upholstered seats. Some stools in this grouping also features a smooth swivel action. Add great seating accents to the bar area or dining area in your home today with this lasting Bar Stools collection. The Bar Stools collection is a great option if you are looking for furniture in the Houston, Sugar Land, Katy, Missouri City, Texas area. Browse other items in the Bar Stools collection from Rooms Furniture in the Houston, Sugar Land, Katy, Missouri City, Texas area.